ValsVeils (a division of SashANation) creates BACHELORETTE VEILS and VEIL & SASH SETS. 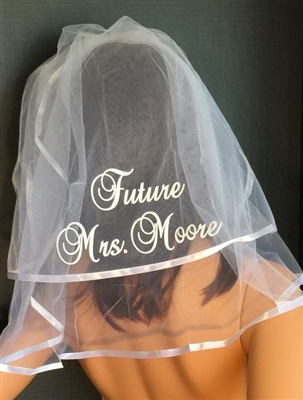 The veils are custom made and personalized with sparkling GLITTER or SHINY (Hologram) lettering and come in an array of colors or choose our brilliant RHINESTONE lettering. Make a statement with your veil! Choose your phrase but please limit to no more than 25 letters.